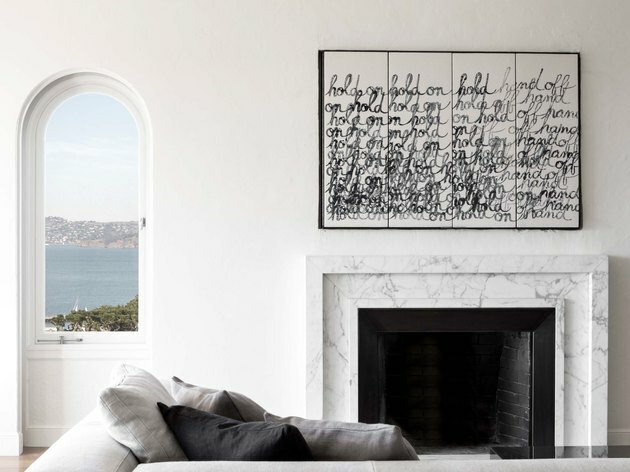 A chic makeover by interior design firm NICOLEHOLLIS transformed a San Francisco apartment from an empty canvas to a striking art-filled home. 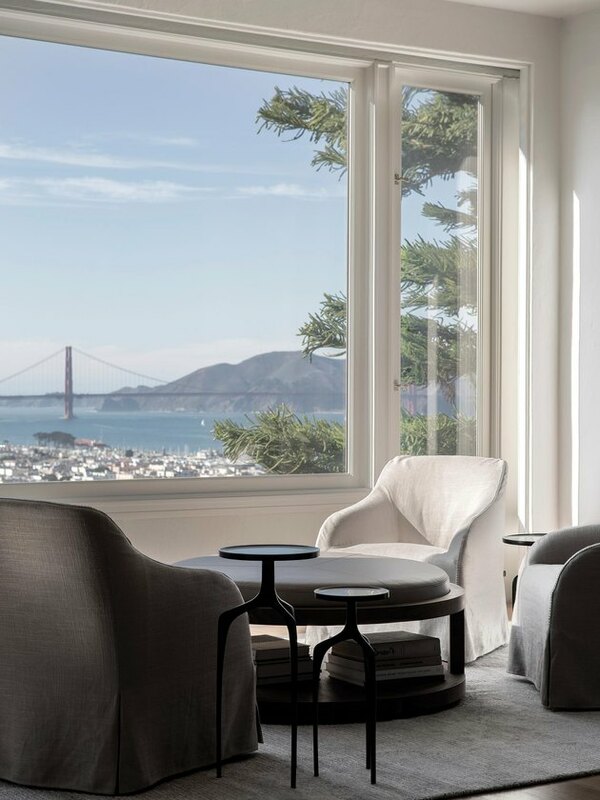 Expertly curated with a neutral color scheme that complements sweeping views of the Golden Gate Bridge, the Russian Hill apartment was curated with California artists in mind, with pieces by Christopher Badger and Bernadette Jiyong Frank. To truly highlight the art, proper lighting was crucial, so Hollis brought in unique fixtures by David Weeks and Tom Dixon. "We were working with a completely clean slate to start, so lighting and art play a huge role in making the space what it is — a holistic approach to living," says Hollis, principal and creative director of her firm. While working with a blank canvas is a designer's treat, the project wasn't without its challenges, mostly due to the building's small elevator. "We had to think outside the box and select furniture that would be able to make it up the stairs," Hollis told us. The answer? Getting creative by designing custom pieces that could make the journey up to the apartment. An asymmetrical Tate bench from Hudson Furniture sets the tone for stark contrasts. 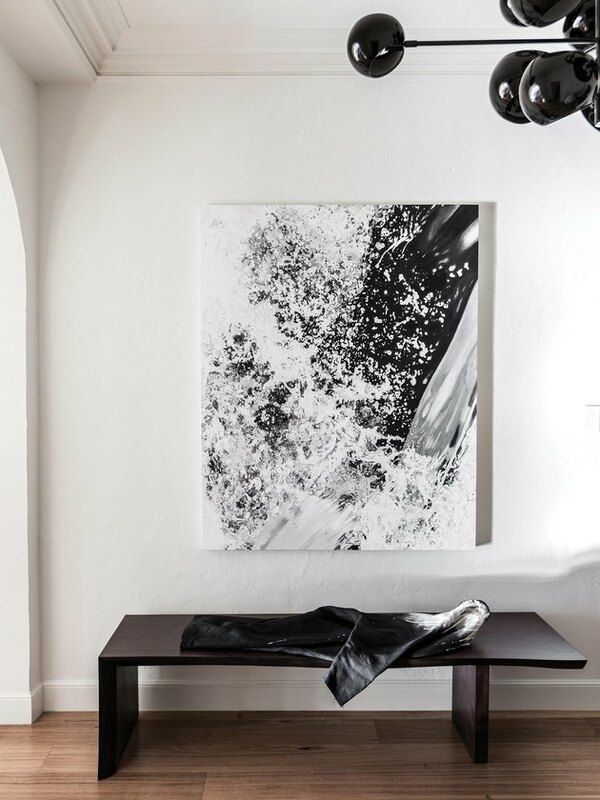 Above, art by Los Angeles painter Conrad Ruiz enlivens the wall space and an adjustable Kopra Burst chandelier by David Weeks illuminates the room. A blackened steel bar cabinet was custom created by the team and features a polished mirror interior. 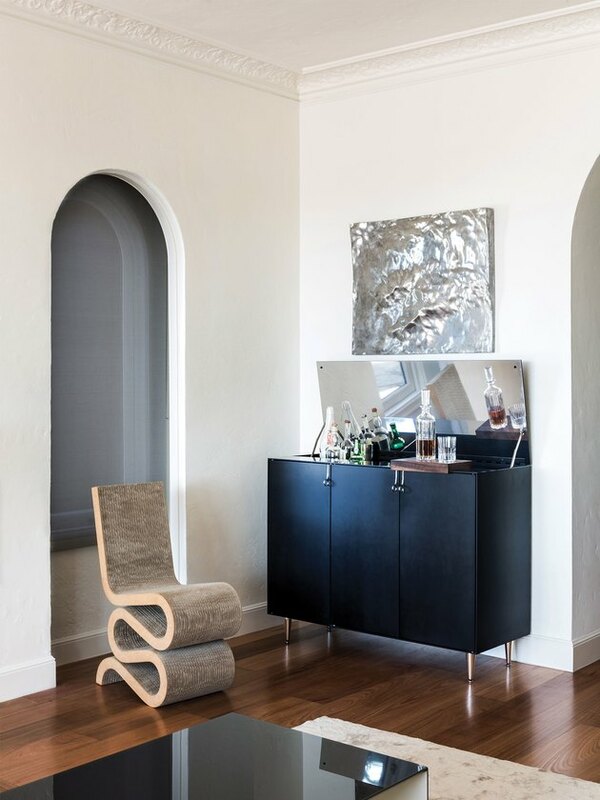 A Wiggle chair, designed by Frank Gehry for Vitra, adds a postmodern element to the room. The firm designed a unique way to hide the TV in the living room by constructing an artistic concealing cabinet — the folding panels feature block-printed fabric by Miriam Dym. 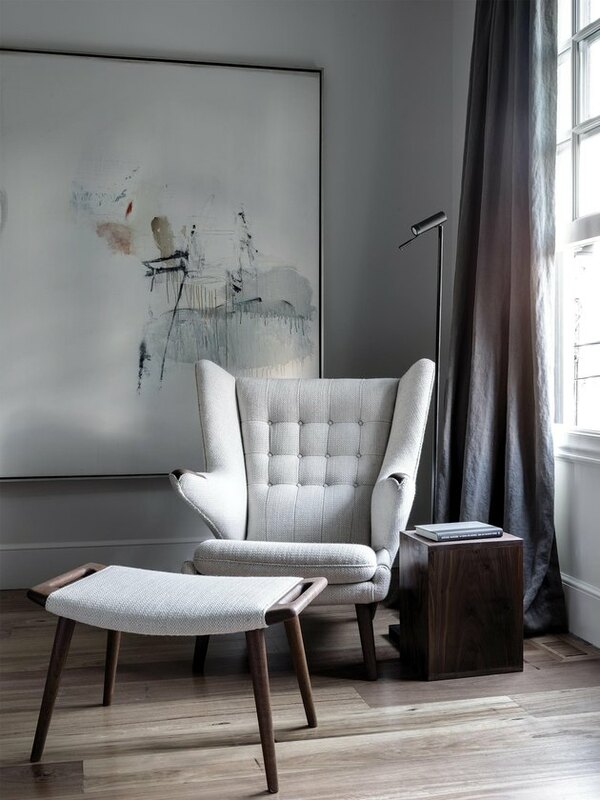 Modernica's Papa Bear chair offers a Scandi touch. With such large-scale artwork in the background, clean colors and lines maintain a sense of calm minimalism. When you have a picture window that offers such a colorful, stunning view, there's no need to infuse a space with tons of color — blacks, whites, and grays allow the beauty outside to shine. A coffee table by Glas Italia is a sleek addition to the living room. The space, defined by the large Wing sofa from San Francisco-based Flexform, is contained, yet comfortable. 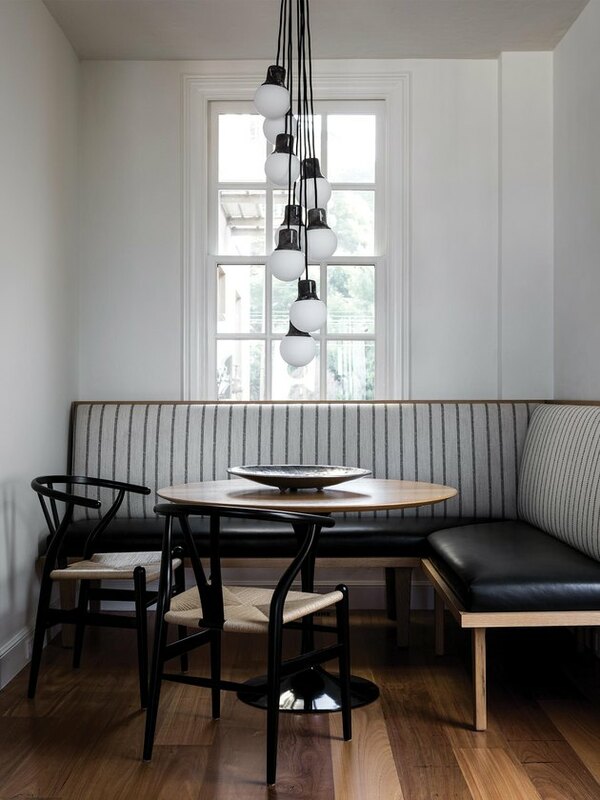 The banquette, designed by Hollis, provides the breakfast nook with additional seating. Wooden Wishbone chairs surround the table. 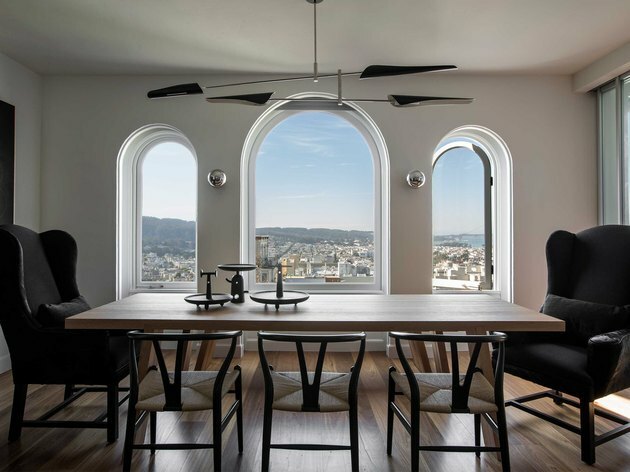 Wishbone chairs also make an appearance in the dining room, where they're paired with wingback chairs from SF-based Coup D'Etat. 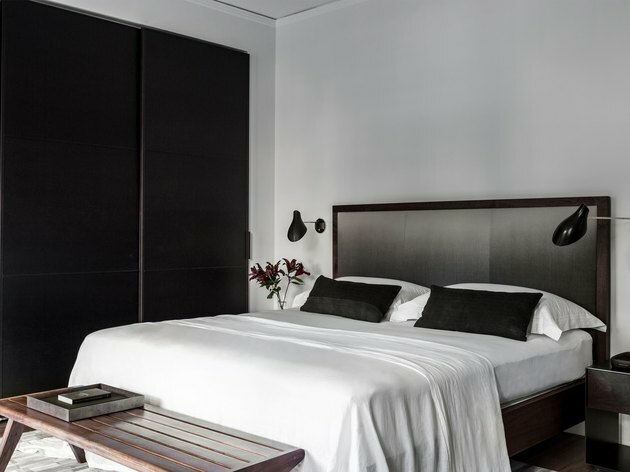 We're crushing hard on that headboard, which sports a subtle ombre effect. 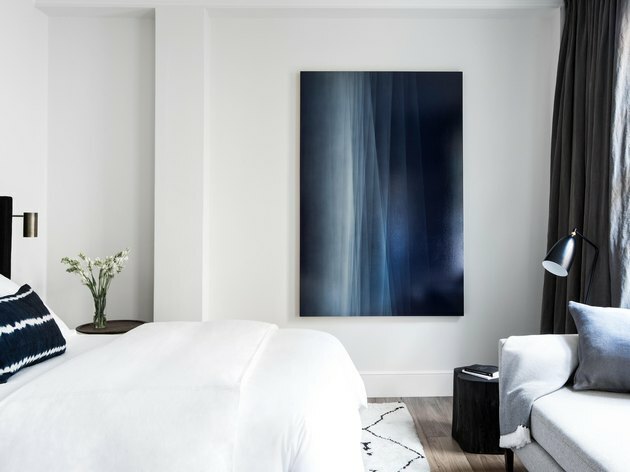 In the guest bedroom, a painting by San Francisco artist Bernadette Jiyong Frank evokes the colors of the ocean.